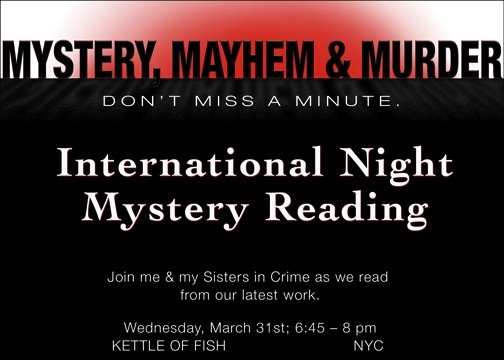 5 of our local Sisters will be reading selections with international appeal at the legendary Kettle of Fish in Greenwich Village at 59 Christopher St. Lina Zeldovich, Pat King, Liz Zelvin, Peggy Ehrhart, and Cathi Stoler, who was nice enough to share her flyer, will be reading short selections from their works from 6:45 to 8pm. This is our first public reading- Hope to see you there! This entry was posted on March 25, 2010 by nysinc. It was filed under Events, Member News .